Copper-catalyzed amination refers to the coupling of an amine with an aryl or alkenyl electrophile in the presence of a copper catalyst and base to form a new carbon-nitrogen bond. One of the earliest examples of metal-mediated amination, involving the arylation of amines in the presence of a copper salt, was reported by Ullman in 1903. The reaction required high temperatures and a stoichiometric amount of the copper salt, and generally afforded low yields of product. 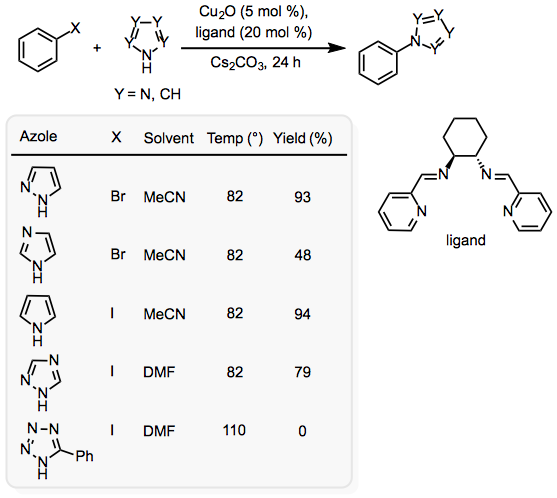 After a long period in which copper-mediated aminations remained the state of the art, palladium-catalyzed amination reactions were developed that did not suffer from the issues associated with the Ullman reaction. The relatively high cost of palladium eventually motivated a renewed interest in copper-catalyzed amination methods (Eq. 1), which exhibit trends in selectivity and reactivity that are in some cases complementary to those of palladium-catalyzed reactions. Some uncertainty remains regarding the mechanism of copper-catalyzed aminations, as evidence exists for both single-electron transfer (SET) and oxidative addition/reductive elimination (OA/RE) pathways. In some cases, both mechanisms may be operating simultaneously. Despite this uncertainty, copper-catalyzed aminations have been applied in a number of syntheses of natural products. Aromatic or heteroaromatic halides are the most common electrophiles employed, although alkenyl halides are also reactive in many cases. Amines may be unactivated or contain an electron-withdrawing group to facilitate deprotonation with a base of moderate strength. The general process of copper-catalyzed amination reactions involves coordination of the nucleophile to the metal center, activation of the C–X bond, and C–N bond formation. The details of these general steps remain under debate. In particular, how the electrophile is activated and how the C–N bond forms remain somewhat unclear. Initial formation of a Cu-amide complex is supported by the observation that copper(I) amido complexes react at rates similar to other copper(I) complexes. Subsequent activation of the electrophile and C–N bond formation may occur through either one-electron or two-electron processes. Four pathways have been proposed for this portion of the mechanism: OA/RE, SET, nucleophilic aromatic substitution via π-complexation of the catalyst to the arene, and σ-bond metathesis. Specific experiments provide support for all four of these mechanisms, but the OA/RE and SET mechanisms seem most likely in the majority of copper-catalyzed aminations (Eq. 2). 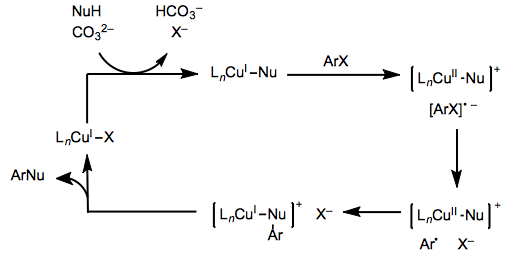 In the oxidative addition/reductive elimination pathway, oxidative addition first produces a copper(III) intermediate in which the nucleophile and arene are both ligated to the metal. Subsequent reductive elimination generates the product and regenerates the catalyst. This mechanism is supported by the reactivity trend of aryl halides (ArI > ArBr > ArCl >> ArF) and by observations of hydrodehalogenation, which is proposed to occur via β-hydride elimination of the amide ligand followed by reductive elimination to form a C–H bond. EPR spectroscopy experiments and computational studies suggest the involvement of copper(II) complexes in some copper-catalyzed amination reactions. A copper(II) complex may form after electron transfer from a Cu(I)-amide complex to the aryl halide (Eq. 3). Loss of halide from the resulting radical anion followed by coupling of the aryl radical and copper produces a cationic copper(I) complex. Subsequent reductive elimination regenerates the catalyst and forms the C–N bond. Complicating the picture further, a wealth of evidence suggests that radical intermediates are not involved in copper-catalyzed aminations. For example, substrates containing radical clocks do not undergo rearrangement, and reactions under N2 with copper(I) salts are faster than reactions run in air. 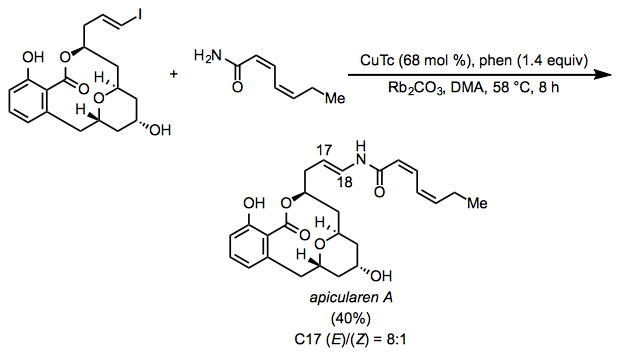 Oxidative addition/reductive elimination is most likely operating in reactions of ligated copper(I) complexes. Copper-catalyzed amination is highly useful for the preparation of aryl amides and N-arylated heterocycles. Although alkenyl electrophiles can be used in some cases, aryl electrophiles are more commonly employed. Among aryl electrophiles, aryl iodides react most rapidly, followed by aryl bromides and aryl chlorides. Aryl iodides can react selectively in the presence of an aryl bromide (Eq. 4). Aryl chlorides and bromides bearing electron-withdrawing groups give the best yields in general, while electron-rich aryl bromides and chlorides react sluggishly (Eq. 5). In many metal-catalyzed cross-coupling reactions, coordination of heteroatoms to the metal center impedes catalysis. Copper catalysts are not as susceptible to this problem as palladium catalysts. In fact, six-membered heterocyclic chlorides are typically more reactive than aryl chlorides and five-membered heterocyclic chlorides despite the coordinatively active lone pair in the former. For example, 2-chloropyridine and 2-chloropyrimidine both give higher yields of coupling product than chlorobenzene in coupling reactions with benzimidazole (Eq. 6). Alkenyl halides are effective as electrophiles when paired with nucleophiles that form stable N-alkenes, such as amides and azoles. The reactivity of alkenyl halides is largely unaffected by electron-donating and -withdrawing substituents. Monosubstituted, disubstituted, and trisubstituted alkenes have all been employed with success. Retention of configuration of the alkene is generally observed, suggesting an OA/RE mechanism (Eq. 7). Use of a ligand is generally necessary in reactions of alkenyl halides. Alkenyl chlorides are much less reactive than bromides and iodides, but they may be employed in intramolecular couplings at high temperatures (Eq. 8). The trend in reactivity of nitrogen nucleophiles in copper-catalyzed aminations is opposite that of palladium-catalyzed aminations. More acidic amides and azoles are more reactive than unactivated amines. Anilines are useful coupling partners in copper-catalyzed aminations, but are less reactive than amines in general (Eq. 9). Coupling of ammonia nucleophiles is difficult with palladium catalysts, but copper catalysts are effective in coupling reactions with aryl halides. Aqueous ammonia is a convenient source, and ammonium chloride can also be used. Primary and secondary amines are useful substrates, but tertiary amines are too hindered to react efficiently. A number of amino acids have been employed in this reaction with no loss of configurational purity at the &alpha-carbon (Eq. 10). Azoles are highly effective nucleophiles in copper-catalyzed amination reactions, with the important exception of acidic tetrazoles (Eq. 11). Heterocycles must strike a balance between acidity of the azole, which is important for copper-azolate formation in the early stages of the mechanism, and nucleophilicity of the azolate, which is important for the C–N bond-forming step. Mixtures of constitutionally isomeric N-arylated products can be a limitation of the reaction in some cases, but C-arylation is rarely an issue. Amides are generally more reactive than amines in arylations due to their greater acidity. Arylation occurs exclusively at nitrogen with the exception of reactions involving pyridones and hindered electrophiles, which can afford substantial amounts of O-arylated product. Hydrazides react at the more acidic nitrogen attached to the carbonyl group (Eq. 12). Copper-catalyzed aminations are synthetically attractive due to their simplicity and functional-group tolerance. Alkenylation and arylation of amides are most commonly used in synthesis. This reaction is a natural choice in some syntheses of nitrogen-containing alkaloids, as it can establish key carbon-nitrogen bonds. For example, arylation of a primary amide was used in a synthesis of the core of the macrocyclic cyclotrienins (Eq. 13). The macrocycle was elaborated from the ends of the aryl amide intermediate. Alkenylation of a primary amide was used in a synthesis of apicularen A (Eq. 14). This reaction illustrates the functional group tolerance of copper-catalyzed aminations, as the alcohol, ester, ether, and phenol groups were all reasonably well tolerated under the reaction conditions. Copper catalysts are commonly employed in intramolecular lactamization and macrolactimization reactions. Anumber of alternative methods for arylation or alkenylation ofnitrogen-containing substrates are known. Some of the earliest arylations ofamines relied on nucleophilic aromatic substitution reactions with veryelectron-deficient arenes (Eq. 15). These reactions aresignificantly limited by the requirement of an electron-poor arene. More recent methods employ metal catalysts to facilitate C–N coupling. The primary competitor to copper catalysts in this regard are palladium catalysts, which facilitate the coupling of nucleophilic amines with electrophilic aryl and alkenyl halides in a process known as the Buchwald-Hartwig reaction (Eq. 16). Palladium catalysts are not as effective as copper catalysts in reactions of amides and azoles, but generally require shorter reaction times than copper catalysts in reactions of amines. Electrophilic amination methods are potential alternatives in cases when coupling between a nucleophilic amine and electrophilic organohalide is ineffective. These reactions typically require a strong carbon nucleophile, but may proceed smoothly without the intervention of a metal catalyst. For example, aryl Grignard reagents react with nitroarenes to form diarylamines in good yield upon reductive workup (Eq. 17). Awide variety of copper sources, ligands, and bases may be used in copper-catalyzedaminations. Copper(0), copper(I), and copper(II) precatalysts have all beenused successfully, although copper(I) halides seem to be the most versatilecopper sources. Ligand is not necessary for the reaction to occur, butligand-free reactions generally require higher temperatures and longer reactiontimes than reactions employing ligands. The most common ligands used arediamines such as dimethylethylenediamine (DMEDA), amino acids such as prolineand dimethylglycine (DMG), pyridine-based ligands such as phenanthroline, andoxygen-based ligands such as diols and diketonates. Abase is necessary for the formation of a copper-amide complex in the earlysteps of the mechanism. Typically, inorganic phosphate or carbonate bases withlarge cations (such as rubidium or cesium) are employed. Polar aprotic solventsare commonly used to ensure solubility of the reactants, although high-boilingaromatic solvents such as toluene are often essential in ligand-free reactions.Microwave irradiation andultrasound have been used to acceleratecopper-catalyzed aminations. An oven-dried, 10-mL Schlenk tube equipped with a Teflon valve was charged with a magnetic stir bar, CuI (9.5 mg, 0.050 mmol), and Cs2CO3 (650 mg, 2.0 mmol). The tube was evacuated and refilled with argon. Under a counterflow of argon, 3-iodoaniline (219 mg, 1.0 mmol) and 5-amino-1-pentanol (155 mg, 1.5 mmol) were added followed by DMF (0.5 mL) and 2-isobutyroylcyclohexanone (34 mg, 0.2 mmol). The tube was sealed and the mixture was stirred under argon at ambient temperature (22 °C) for 22 h. After the starting material was consumed, the reaction mixture was diluted with dichloromethane and filtered. The solvent was removed by rotary evaporation, with heating if necessary, to ensure the removal of most of the DMF. The residue was purified by column chromatography on silica gel (EtOAc/hexanes). The product-containing fractions were concentrated by rotary evaporation and dried under high vacuum for at least 1 h to remove residual solvent. N-(3-Aminophenyl)-5-amino-1-pentanol was recovered as a yellow oil (165 mg, 85%): 1H NMR (CDCl3) δ 6.95 (pseudo t, 1H), 6.07–6.04 (m, 2H), 5.94 (pseudo t, 1H), 3.60 (t, J = 7 Hz, 2H), 3.28 (br s, 4H), 3.06 (t, J = 6 Hz, 2H), 1.64–1.53 (m, 4H), 1.47–1.42 (m, 2H); 13C NMR (CDCl3) δ 149.8, 147.7, 130.2, 105.1, 104.3, 99.8, 62.8, 44.1, 32.6, 29.5, 23.6. ↑ Hartwig, J. F. Acc. Chem. Res. 2008, 41, 1534. ↑ Strieter, E. R.; Bhayana, B.; Buchwald, S. L. J. Am. Chem. Soc. 2009, 131, 78. ↑ Sperotto, E.; van Klink, G. P. M.; van Koten, G.; de Vries, J. G. Dalton Trans. 2010, 39, 10338. ↑ Bethell, D.; Jenkins, I. L.; Quan, P. M. J. Chem. Soc., Perkin Trans. 2 1985, 1789. ↑ Arai, S.; Hida, M.; Yamagishi, T. Bull. Chem. Soc. Jpn. 1978, 51, 277. ↑ Jones, G. O.; Liu, P.; Houk, K. N.; Buchwald, S. L. J. Am. Chem. Soc. 2010, 132, 6205. ↑ Weingarten, H. J. Org. Chem. 1964, 29, 3624. ↑ Cristau, H.-J. ; Cellier, P. P.; Spindler, J.-F.; Taillefer, M. Chem.—Eur. J. 2004, 10, 5607. ↑ Lv, X.; Bao, W. J. Org. Chem. 2007, 72, 3863. ↑ Klapars, A.; Huang, X.; Buchwald, S. L. J. Am. Chem. Soc. 2002, 124, 7421. ↑ Xi, Z.; Liu, F.; Zhou, Y.; Chen, W. Tetrahedron 2008, 64, 4254. ↑ Xie, Y.-X. ; Pi, S.-F.; Wang, J.; Yin, D.-L.; Li, J.-H. J. Org. Chem. 2006, 71, 8324. ↑ Shen, G.; Lv, X.; Qiu, W.; Bao, W. Tetrahedron Lett. 2008, 49, 4556. ↑ Lu, H.; Li, C. Org. Lett. 2006, 8, 5365. ↑ Mei, X.; August, A. T.; Wolf, C. J. Org. Chem. 2006, 71, 142. ↑ Xia, N.; Taillefer, M. Angew. Chem., Int. Ed. 2009, 48, 337. ↑ Kim, J.; Chang, S. Chem. Commun. 2008, 3052. ↑ Ma, D.; Zhang, Y.; Yao, J.; Wu, S.; Tao, F. J. Am. Chem. Soc. 1998, 120, 12459. ↑ Deng, X.; McAllister, H.; Mani, N. S. J. Org. Chem. 2009, 74, 5742. ↑ Jiang, L.; Lu, X.; Zhang, H.; Jiang, Y.; Ma, D. J. Org. Chem. 2009, 74, 4542. ↑ Evano, G.; Schaus, J. V.; Panek, J. S. Org. Lett. 2004, 6, 525. ↑ Su, Q.; Panek, J. S. J. Am. Chem. Soc. 2004, 126, 2425. ↑ Evano, G.; Toumi, M.; Coste, A. Chem. Commun. 2009, 4166. ↑ Wrona, I. E.; Gabarda, A. E.; Evano, G.; Panek, J. S. J. Am. Chem. Soc. 2005, 127, 15026. ↑ Ross, S. D.; Finkelstein, M. J.Am. Chem. Soc. 1963, 85, 2603. ↑ Sapountzis, I.; Knochel, P. J. Am. Chem. Soc. 2002, 124, 9390. ↑ Martín, A.; Pellón, R. F.; Mesa, M.; Docampo,M. L.; Gómez, V. J. Chem. Res. 2005, 9, 561. ↑ Pellón, R. F.; Estévez-Braun, A.; Docampo, M. L.; Ravelo,A. G. Synlett 2005, 1606. ↑ Shafir, A.; Lichtor, P. A.; Buchwald, S. L. J. Am. Chem. Soc. 2007, 129, 3490. This page was last modified on 9 October 2014, at 15:53.